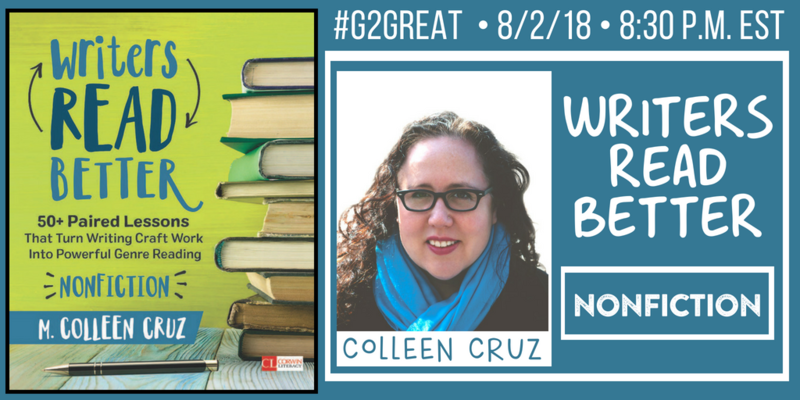 On August 2, 2018, we had the great pleasure to welcome Colleen Cruz back to our #G2Great chat as second time guest host. Our first chat on 3/30/17 celebrated her wonderful book, The Unstoppable Teacher: Real Strategies for the Real Classroom. (Heinemann, 2015). 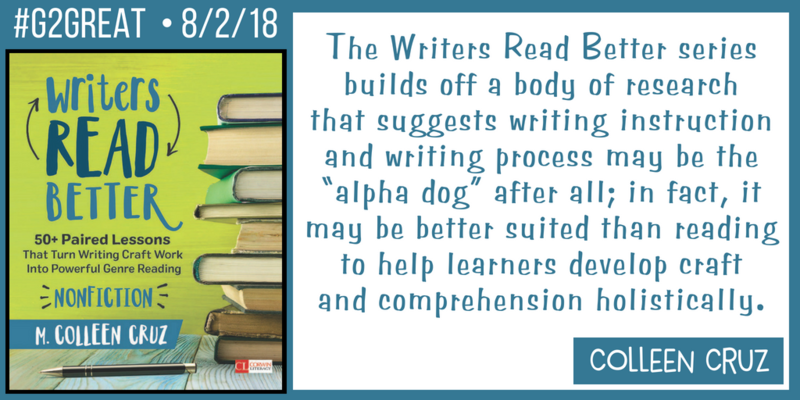 Of course, we didn’t hesitate to begin planning for a repeat visit as soon as we heard about Colleen’s amazing new book, Writers Read Better: 50+ Paired Lessons That Turn Writing Craft Work into Powerful Genre Reading (Corwin, 2018). We were thrilled to spotlight this powerful new perspective for nonfiction writing. Your book fills an important void in the literacy world by celebrating the reading/writing connection with a twist. Why did you decide to write about this particular topic? I’ve been playing with the idea behind this book for several years. Those ideas began with a game I frequently play with my friends who are also writers (Colleen wrote about this in the introduction of her book on page 16). I would read a headline and then they would guess how the lead was going to go. I noticed that my friends who were writers were far better at playing the game than those who were not. This made me really think about the idea that writers really do read better. I often think about this idea as a reader and a writer. When I’m in the middle of a book, I’m so much more aware of the moves that writers are making because I am also a writer. I notice how they use craft and structure and purpose and I can spot fake news in a minute since I can see how they are trying to manipulate the reader as a writer. I feel like this book is very much an idea that I’ve been playing with for a long time and a colleague of mine had been begging me to write about the ideas that led to this book. I wanted to write about the very process that I use in my own life and work and to put those ideas in a book to help teachers move toward this thinking. I think this book is needed because it’s a shift in our thinking. Teachers typically think about writing about reading or mentor texts so the ideas in this book are asking us to think of writing as a way to service reading and that felt so important. I didn’t write this book sooner because it felt so obscure so I wanted to really think about how I approach this in my own life to make it clear to teachers through this book. The main reason I wrote this book is that I know how it has impacted me as a writer. As writers, we are a thousand times stronger readers than those who are not writers. There are so many things that teachers haven’t tapped into yet and so I wanted to support this thinking. How can we encourage teachers to embrace writing as an entry point that would also increase reading understanding? Where can teachers begin to do this important work? I think that this depends on the priorities and needs of each teacher. Sometimes our needs aren’t always our priorities and so we have to take that into consideration to begin this work. One place I see teachers as most interested in doing that work are those who feel pressed for time – for example, middle school teachers who are compartmentalized. They are limited in the amount of time they have so approaching reading through writing makes the work more efficient and streamlined. For many teachers, the typical strategies they are using in reading to teach comprehension, decoding or engagement just aren’t working. They feel at a loss for what they can do to move those students forward when what they are doing isn’t addressing their needs. Sometimes the best way to support those kids is for them to be on the other side of a desk and assume the role of writer. Helping them to approach reading through writing gives them a meaningful purpose and empowers them as both a writer and reader. Writing gives them the behind the scenes tricks to see how texts work. When kids realize that they just wrote a piece about their dog, then they can begin to see that this will help them read a text about volcanoes. This gives us a different way into reading and it’s such a powerful process. Many teachers say that they’ve instinctively felt those connections between reading and writing and yet they haven’t looked at the ways that writing lifts reading. For those teachers, Writing About Reading is absolutely next step territory for them to explore this powerful process. Reciprocity has long been an essential topic in literacy research. How does Writers Read Better explore the teaching of reading and writing from a different perspective? When I first began writing, I was really surprised to learn that there were no books on this topic. I was aware that the research supporting this idea goes back as early as the 1950s. Lucy Calkins was one of the first to show that these connections existed and that often kids learn to write before they learn to read. So, this is not new research. What’s interesting to me is that Katie Wood Ray wrote about how reading supports writing in 1999 in her groundbreaking book Wondrous Words. I think a lot of people hadn’t really looked at this idea before but as soon as we read about it, it seemed so obvious. Because the ideas were so earth shaking, many teachers only think about reading coming before writing. We as teachers tend to hold onto our thinking in one direction. I recently had an experience where I was looking at my computer screen in a video chat but it was showing the mirror image so I had a hard time knowing which hand to raise and which side of the book to hold up. A lot of teachers have used mentor texts as a way to use reading to support writing so looking at how writing supports reading may feel foreign. Many teachers believe that reading has to come first because that’s what they learned and so it feels more natural. But if teachers were to truly look at the research they could see that we can support the first independent exploration of a text in reading by exploring that thinking on paper first through writing. I think many of us just hadn’t thought of it that way before so now we are considering a different way of looking at our teaching. For most teachers, once they’ve explored this idea they think, “Of course!” They begin to realize for the first time that it’s been there all along, like when you look at the dashboard and see the gas tank image. It’s always been there but we just haven’t noticed it before. Now we can begin to think about reading and writing in a unique way. Helping teachers maneuver this different way of thinking is the crux of my entire book. For some reason, they may be having a hard time wrapping their heads around how writing can help reading. And even though it may be what we learned first, we can change our perspective by looking from a different angle. You created incredible lesson samples in the book. What thinking were you hoping to support by sharing these lessons? I don’t write “lessons” so I didn’t intend to write lessons in this book. But as I started thinking about the book, I realized that in order for teachers to be able to do this work, they would actually need to see it in action. The lessons are meant as flexible ideas, so a “One thing you can do is…” kind of thinking. This helps teachers see what this could actually look like in practice. I tried to make the lessons as streamlined as possible such as creating the lesson steps at the beginning. A teacher who knows how reading and writing workshop works could just read the lesson steps and create their own lesson process while there are specific examples for those who need more support. I wanted the lessons to be written out the same way that I would do those lessons with children so that teachers could imagine one way the lessons might look. After Carl Anderson read the manuscript he said that he started playing a game with himself where he would wonder what the flip side of this reading skill was in writing. He said that it was helpful to see an example of a flip side of writing using reading. I intentionally did not include every writing skill in this book because this is not a writing for writing sake but a writing for reading sake book. The paired aspect of the lessons is the essential piece, so the only lessons in the book are lessons that support reading. You can find wonderful informational writing lessons in gorgeous books like Craft Lesson by Ralph Fletcher and JoAnn Portalupi or Lucy Calkins’ Units of Study. This isn’t a book just about writing, but the interplay between reading and writing. Any lessons you would purely teach for reading or for writing aren’t in the book. Pairing the lessons helps to give the message that the lessons are supporting the reciprocal skills for both reading and writing. What looks different when a teacher is a teacher of literacy rather than a teacher of reading and a teacher of writing? The message that I am after is that I’m not teaching a subject but am teaching you how to be a literate human being. Some teachers say, “I’m a writing teacher so I have to teach grammar, thesis statements and show not tell” or “I’m a reading teacher so I have to teach decoding, prediction, and interpretation.” They may teach both of those subjects in the day and yet they still think of them differently. When they’re in reading workshop, they’re only thinking about reading. When they’re in writing workshop, they’re only thinking about writing. My goal is to change that thinking. I do think that the digital revolution has helped this thinking. The digital revolution underlined the notion that literacy is a dialogue. We don’t just send our ideas off like a message in a bottle. Our readers read but our readers also write. This provides an amazing interplay as a reader and a writer. This idea also has huge implications in terms of things like social justice and the way we live in our world now. When we take in information like a sign in the subway, it’s not enough to take that in passively but to think about what it means in our world. So, when you’re teaching literacy you’re teaching active reading and active writing in response to it. What do you hope this book will accomplish in the education field and inspire these changes in our teaching? Well I have a hope and a worry for this book so I want to start with the worry. My first book, Independent Writing, was published in 2004 (Heinemann). When that book came out my hope was that teachers would open up new opportunities for kids to write and to engage in more independent projects. Unfortunately, that book was ahead of its time and many still consider it revolutionary that kids could actually run their own writing projects. My fear is that Writing About Reading will sit on the shelf as an idea that is ahead of its time even though it stands on the shoulders of esoteric research. My fear is that it might not change the way that teacher teach and that they will still see their role as teaching reading and writing vs. teaching literacy. My hope is that when teachers are teaching writing they will begin to see the connections to reading and how they can use writing to support reading and when teaching reading they will think about what could come comes before this or after this. I hope that they will begin to wonder if there is a reciprocal skill that they can explore. If we are willing to look outside of the way we think about of reading and writing then we can begin to explore writing in science, socials studies, math and across the learning day. When students are watching a music video or commercial, I would hope that they will also think about something they have written so that they can see the interrelationships between word choice, language and meaning. My hope is that teachers will start to change the way that they look at their teaching and that they will always think about the other side or ancillary skill and recognize multiple sides for another way of thinking. It’s like moving our teaching from 2-D to 3-D thinking. Do you have any closing thoughts you’d like to share? I hope that teachers know that the book is designed to make their lives easier and more fun. This is a book with a lot of fun and joy and I made a real effort to make it accessible to different learning needs with many unique access points that lean on 21stcentury ideas – not just digital tools but the mindset of the information revolution that we will need to engage in critical thinking as both producer and consumer. The biggest thing that I hope is that it makes the readers of the book understand that they can go off the rails and invent their own lessons that are playful accessible and interconnected.